That doesn’t describe most Americans, who may be much larger (or smaller). About one-third of the U.S. adult population is obese. Obesity is defined by the World Health Organization as a body mass index of 30 or greater. BMI is an individual’s mass divided by the square of height. Crash tests and real-world crash data show that obese people don’t fare as well in frontal car crashes as people who are not obese. The obese are far more likely to suffer injury, particularly to the legs and feet, and are significantly more likely to die in a crash. 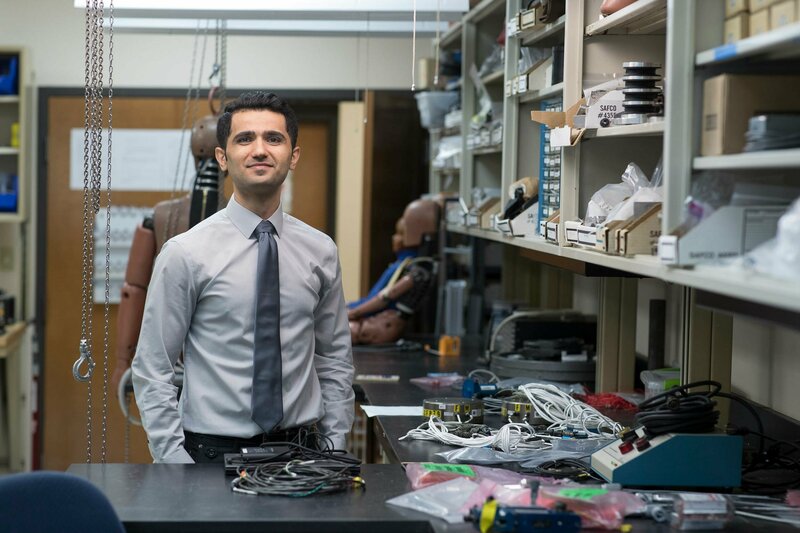 Joodaki is working at UVA’s Center for Applied Biomechanics to develop a better seatbelt design, specifically for the obese. The lab focuses on understanding how the body responds to crashes and how to improve safety features. Joodaki is using a state-of-the-art virtual human model with a body mass index of 35, designed to mimic the behavior of an obese occupant when under impact. This detailed model is based on both the overall human body and the mechanical properties of biological tissues. Using new models in conjunction with laboratory crash test data and data from real-world crashes, Joodaki’s goal is to better understand the types of injuries that obese people suffer, how they happen, and to develop a restraint system that would better protect the obese. Joodaki said that thick fat at the belly and around the waist prevents a seatbelt from properly gripping the pelvic bones. A properly engaged seatbelt on a thinner person rests low, below the belly, and creates resistance during an impact, easing the driver or passenger slightly forward as the airbag deploys. But for a person with a large amount of belly fat, the seatbelt often does not properly hold the pelvic region and instead slips upward. The person then may slide forward from under the belt on impact, often resulting in injury when contact is made with the lower instrument panel. Joodaki is trying a new design that would factor in the weight of a driver or passenger to provide optimal force level and timing for seatbelt engagement during a crash. He also is considering the viability of inflatable seatbelts. The research involves using a UVA supercomputer to run hundreds of crash simulations with different restraint parameters to identify the most optimal. He expects to complete his project by the end of the year. The research is sponsored by the National Highway Traffic Safety Administration. 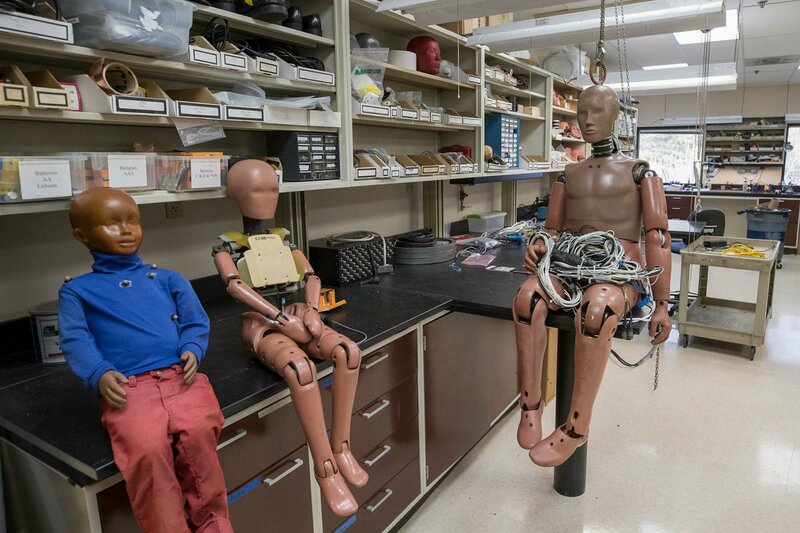 The UVA Center for Applied Biomechanics also is conducting research to improve automotive safety for smaller women and for children, using biomechanical investigations for body sizes outside the range of the average-size male.